Glass cleverly combines characters and events from Unbreakable (2000) and Split (2017) into a modern superhero yarn. M. Night Shyamalan (who writes, directs and makes a brief cameo here) has crafted a dual sequel that focuses on common people who possess superpowers, or at least those who believe they do. That psychosis angle is one of the movie’s more fascinating aspects. Do David Dunn (Bruce Willis), Elijah Price, a.k.a. 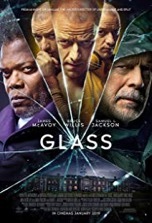 Mr. Glass, (Samuel L. Jackson) and Kevin/Patricia/Hedwig/The Beast (James McAvoy) actually have superhuman abilities, or is it all in their heads? Unfortunately, just like Dunn’s aversion to immersion and Mr. Glass’ vulnerability to gravity (and everything else), the film’s Achilles’ heel is sameness. One of the movie’s themes, “the strength in brokenness,” is borrowed wholesale from Split. That film had a great deal to say about the current state of mental health and its implications on the nature and future of humanity. This film eschews those weighty topics in favor of the passé notion that everyday heroes live among us (shades of The Incredibles, Heroes and every Marvel TV show ever produced). Another measure of sameness is the acting. McAvoy is just as brilliant here as he was in Split, but that’s the problem; he’s just playing the same personalities in the same ways. We hang on his every word, anticipating some new quirk or deviation to occur, but there’s nothing different about Kevin’s personality pantheon in this movie. Shyamalan should’ve added a 25th personage to Kevin’s mental stew, someone who could provide a wild card element to the warring factions inside Kevin’s mind. Although it’s nice to see Willis and Jackson again, they’re monstrously underserved in the film. Slow pacing is another drawback—Mr. Glass doesn’t have any significant scenes until halfway through the movie. Much of the film’s action takes place inside or on the grounds of an asylum, which makes it feel insular…and low budget. The promise of a protracted slugfest atop a newly erected skyscraper is downgraded to a parking lot brawl, which is profoundly disappointing. Glass has a few minor twists, but doesn’t have that big A-ha! moment we’ve come to expect from a Shyamalan film. Though the movie makes us second guess ourselves for about three and a half seconds, it needed a more complex and convoluted (like Kevin’s mind) plot to set up a compelling and mind-bending climax. Despite an intriguing concept, fine direction and tremendous performances, Glass still manages to underwhelm. Sorry to shatter your expectations, but Glass isn’t as sharp as Split.